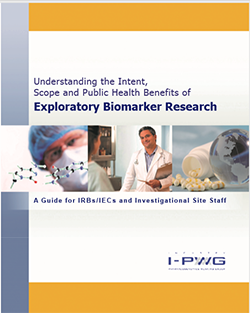 The information available in the Industry Pharmacogenomics Working Group (I-PWG) resource “Understanding the Intent and Public Health Benefits of Exploratory Biomarker and Pharmacogenomic Research” was obtained from information in the following resources. We hope you find these references helpful at better understanding this topic. If you are interested in learning more about genetics or PGx specifically, you may consult the followingresources on the web for more information. As these are web resources please keep in mind that URL’s may change over time. The AMA offers a number of free education and research references that pertain to genetics and molecular medicine. This site provides a wealth of genetics information in various formats (publications, teaching aids, videos, webcasts, etc.). This includes a quick “Genetics 101” lesson that takes you from the genome to the proteome. This free, web-based course is aimed at giving scientists the skills necessary to assess genetics research for validity and utility as well as providing users with the ability to conceive of progressive but feasible studies. NCHPEG is committed to a national effort to a national effort to promote health professional education and access to information about advances in human genetics. Iyer L, King CD, Green MD, et al. Genetic predisposition to the metabolism of irinotecan (CPT-11). Role of uridine diphosphate glucuronosyltravsferase isoform 1A1 in the glucuronidation of its active metabolite (SN-38) in human liver microsomes. J Clin Invest 1998; 101(4): 847-54. Mette L, Mitropoulos K, Vozikis A, Patrinos GP. Pharmacogenomics and public health: implementing ‘populationalized’ medicine. Pharmacogenomics 2012; 13(7): 803-13. Morimoto T, Sakuma M, Matsui K et al. Incidence of Adverse Drug Events and Medication Errors in Japan: the JADE Study. Journal of General Internal Medicine 2011; 26(2): 148-53. Maliepaard M, Nofziger C, Papaluca M et al. Pharmacogenetics in the evaluation of new drugs: a multiregional regulatory perspective. Nature Reviews. Drug Discovery 2013; 12(2): 103-15. Yasuda SU, Zhang L, Huang SM. The role of ethnicity in variability in response to drugs: focus on clinical pharmacology studies. Clinical Pharmacology and Therapeutics 2008; 84(3): 417-23. Ozeki T, Mushiroda T, Yowang A, et al. Genome-wide association study identifies HLA-A*3101 allele as a genetic risk factor for carbamazepine-induced cutaneous drug reactions in Japanese population. Human Molecular Genetics 2011; 20(5): 1034-41. Otsubo Y, Ashahina Y, Noguchi A, et al. Similarities and differences between US and Japan as to pharmacogenomics biomarker information in drug labels. Drug Metabolism and Pharmacokinetics 2012: 27(1): 142-9. Franc MA, Warner AW, Cohen N et al. Current Practices for DNA Sample Collection and Storage in the Pharmaceutical Industry, and Potential Areas for Harmonization: perspective of the I-PWG. Clinical Pharmacology and Therapeutics 2011: 89(4): 546-53. Anderson DC, Gomez-Mancilla B, Spear BB, et al. Elements of Informed Consent for Pharmacogenetic Research; perspective of the pharmacogenetics working group. Pharmacogenomics Journal 2002; 2(5):284-92. Prucka SK, Arnold LJ, Brandt JE, Gilardi S, Harty LC, Hong F, Malia JS, Pulford DJ. An Update to Returning Genetic Research Results to Individuals: Perspectives of the Industry Pharmacogenomics Working Group. Bioethics 2014: in press. Hudson KL, Holohan MK, Collins FS. Keeping pace with the times—the Genetic Information Nondiscrimination Act of 2008. New England Journal of Medicine 2008;358(25):2661-3. Rittenhouse P. Framing DNA collection in the clinic. Biocentury, The Bernstein Report on BioBusiness March 2008:A13-5.